This is a collection of nine familiar Sephardic folk songs, most dating to the 16th century or earlier, both religious and secular in nature, in attractive arrangements for voice with pedal or lever harp accompaniments of moderate difficulty. Texts are in Ladino, with translations provided. 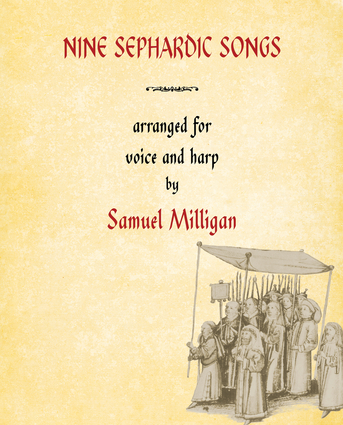 Arranged by a well-known arranger/transcriber, Nine Sephardic Songs is perfect for those preparing voice and harp programs and fills a specific niche in available harp music. Samuel Milligan is a harpist who is best known for the educational materials he has published for lever harp. He has also worked as a harp technician and an editor for the American Harp Journal. He is a member of the American Harp Society. He lives in Brooklyn, New York.